Don’t look now, but the Rangers are the best team in the NHL. After Montreal’s quick start to the season and Dallas’ offensive explosion, it is the New York Rangers (14-2-2) that sit atop the league standings through 18 games after taking down the Toronto Maple Leafs (5-9-4) by a score of 4-3 at Madison Square Garden. The Rangers extended their win streak to nine games, the third longest streak in franchise history and the longest since a 10 game win streak since the 1972-73 season. They also have recorded a point in 13 consecutive games (11-0-2), with 11 wins in their last 12 games (11-0-1). The Rangers have also set a new franchise record for wins (14) and points (30) through the first 18 games of the season. Their record on home ice improves to 9-0-1, with an eight game win streak at the Garden. Over that span, they’ve outscored opponents 33-11 and have a 16.2 shooting percentage. Antti Raanta started his fourth game of the season, making 23 saves and improving his record in home starts to 17-0-3 in home starts along with a 1.56 GAA and a .942 save percentage. He also became the first goalie in franchise history to win each of his first four starts with the team. Glen Healey won his first four games (1993-94) but did not start all of them. Under Vigneault, the Blueshirts have always been good when scoring the first goal, but they’re 4-0-0 this year when trailing after the first period, a testament to their resilience and ability to find ways to grind out wins. The first period was rather uneventful, with no prominent or sustained action happening until the last couple of minutes. The Rangers were a little sloppy with the puck, and were outshot by an active Toronto team, 12-8. The Ranger had an early power play opportunity, but only managed one late shot on goal. The Maple Leafs began to create some more pressure, prompting Antti Raanta to make two excellent save; a glove stop on Tyler Bozak’s deflection, and then a left pad save on Bozak as well. Toronto got on the board first with 2:03 left to play thanks to Peter Holland’s third goal of the year. Viktor Stalberg had the puck taken away from him behind the net, and Holland skated to the front before backhanding a puck through Raanta’s legs. 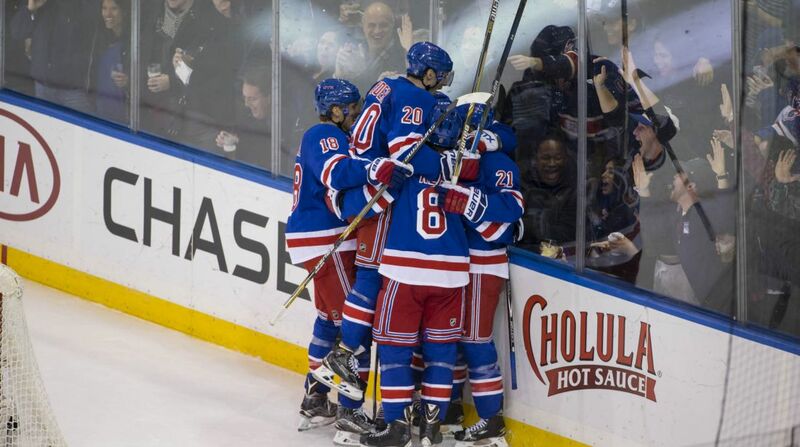 The Rangers came inches away from scoring a tying goal, as Rick Nash hit yet another post. He made three excellent moves, turning the defender inside out before sending a low backhand off of the far post. That did it for the New York and they headed into the locker room trailing. Whatever the message was in the locker room, the Rangers took it to heart, opening the period with passion and aggression, tying the game less than a minute into the second period. New York forced Matt Hunwick into a turnover in their own zone, prompting a breakout play. Zuccarello rushed down the ice and sent a great pass to Ryan McDonagh, who read the play the whole way and played the transition perfectly. His one-timer put the Rangers on the board, giving him his third goal in four games. This was the beginning of the Rangers taking over play in the period. Less than a minute after the captain’s goal, Viktor Stalberg hit the outside of the post on the rush. Rick Nash made a great move and had a shot on goal, and Chris Kreider lost control of the puck in front of the net after Derek Stepan made a great pass off of the boards. Toronto didn’t have a shot on goal until 7:57. The Maple Leafs scored late in the period yet again as Joffrey Lupul scored his second goal in as many games. The puck was blocked in front, and Raanta made a good pad save before Lupul deposited his own rebound, tying the game and setting the scene for an exciting third period. The third period opened up with a goal from the top line again as they continue to remain red hot. Of course it was Mats Zuccarello making things happen again. Zuccs carried the puck through the neutral zone and deep behind the net before dropping a no-look pass to Derick Brassard for a tap in, his sixth goal of the season. But yet again, Toronto found a way to stay in it and answer back with a goal of their own. Toronto captain Dion Phaneuf quickly sent a puck on net, and it appeared to deflect off of Chris Kreider and bounce all over the ice, throwing off Antti Raanta and tying the game at three. Back and forth play ensued as the clock made its way towards zero. Both teams had a few power play chances, and Oscar Lindberg fired a backhand that clanged off of the crossbar. Raanta made some good saves to keep things even. With less than a minute left, the Rangers made their final push. Derick Brassard chipped the puck deep into Toronto’s zone, and when the Maple Leafs tried to clear it, Ryan McDonagh kept the puck in at the blue line, quickly turning and sending a low shot at Bernier. He let up a bad rebound, and Zuccarello cut to the front of the net, transitioning the puck to his backhand before sliding it underneath Bernier’s pads for his third point of the night, sealing a ninth consecutive victory for the Rangers. It’s becoming routine to say, but Mats Zuccarello is playing out of his mind right now. He picked up his second three point night in the past three games, tallying a goal and two assists tonight to give him 18 points (9-9-18) in 18 games. Whether he’s scoring goals or setting up Nash or Brassard, and even back-checking and playing defense, Zuccs is arguably the most important, and most effective, player on the ice every night. Ryan McDonagh is back ladies and gentlemen. After limping through the first month of the season, the second year captain is starting to show glimpses of the 2013-14 Ryan McDonagh that tallied 43 points and played shutdown defense. 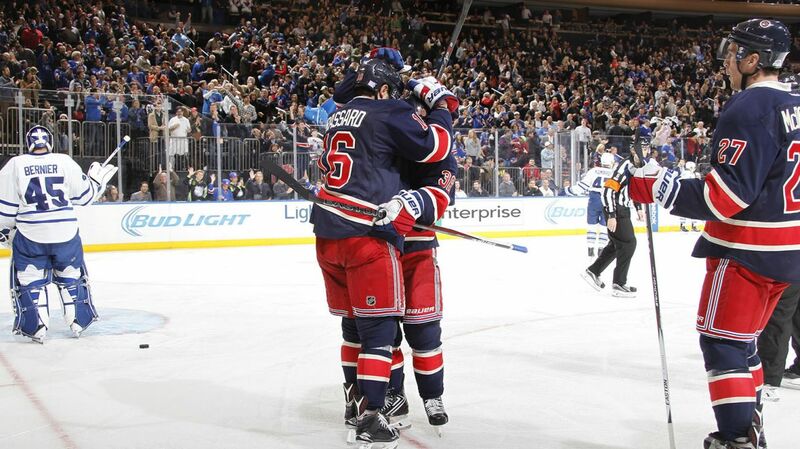 McDonagh scored his third goal in the past four games as well as picking up an assist on Zuccarello’s game winner. He also made some fantastic defensive plays. Hopefully this is the resurgence of the captain as he continues to improve with every game. The Rangers will have a few days off before an emotional game on Thursday when they take on the Tampa Bay Ligntning at the Amalie Arena. Posted on November 16, 2015, in Game Recaps and tagged Alain Vigneault, Babcock, Chris Kreider, Dan Boyle, Dan Girardi, Derek Stepan, Derick Brassard, Dion Phaneuf, Dominic Moore, Dylan McIlrath, Emerson Etem, Jarret Stoll, Jesper Fast, JT Miller, JVR, Kadri, Keith Yandle, Kevin Hayes, Kevin Klein, Marc Staal, Mats Zuccarello, MSG, New York Rangers, New York Rangers blog, NHL, NYR, Oscar Lindberg, Rangers, Rangers blog, Rick Nash, Ryan McDonagh, Toronto Maple LEafs, Viktor Stalberg. Bookmark the permalink. Leave a comment.